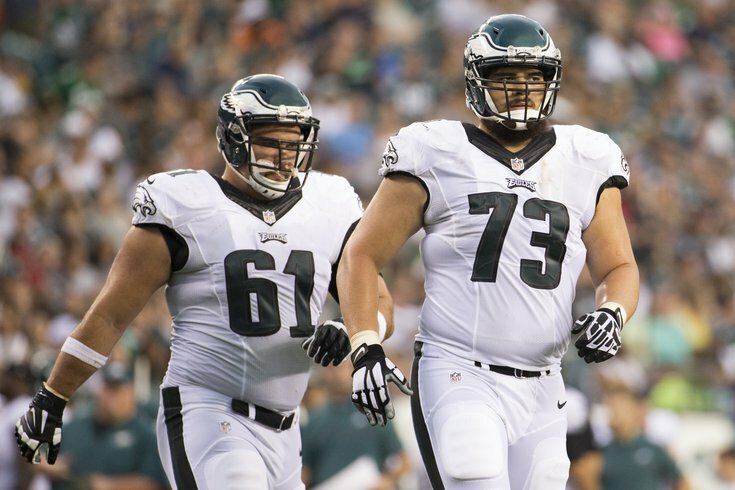 Eagles OG Isaac Seumalo may have earned a starting job the rest of the way with his play on Sunday against the Redskins. In the Philadelphia Eagles' loss to the Washington Redskins Sunday afternoon, rookie offensive guard Isaac Seumalo was pressed into action when starting RG Brandon Brooks was unexpectedly unavailable to play due to illness. It was his second start of the season, with the first being the Eagles' Week 12 loss to the Green Bay Packers, again, when Brooks was a late scratch. In his first start against the Packers, Seumalo was up and down. "There's a little bit of that shock and awe when you first go in," said Frank Reich the week after the Packer game. "He handled himself well, but you can still tell a little bit [that it was his] first game but you can see the signs, and all the signs that you see out in practice, how smart he is, how explosive he is. I think it was a really good start for him. I think it will just get better." Against the Redskins on Sunday, Seumalo was much better. "It's almost a little bit like what you saw with V [T Halapoulivaati Vaitai], when V kind of came in and had an up-and-down first start and then settled down. You could see Isaac settle down and play pretty solid football," Reich said on Tuesday. "There's nothing that can substitute experience and getting in there and playing. There's nothing that can build confidence like playing, having a few good plays and building confidence one play at a time. When you're playing beside other guys that got a little bit of juice, the guy's got juice and you feel that support and practice goes well, I think those are all things that build confidence." Let's take a look at both games, in gif form. Seumalo is #73, the RG. First, the ugly. Here was a goal line situation in which Seumalo got steamrolled by a Packers defender. Wentz actually scored on this play. Here Seumalo whiffs, and is lucky the Packers defender just falls over during his free run at Wentz. Here Seumalo gets rag-dolled by a Packer defender. The Eagles are lucky they ran to the left side instead of the right or this might have been a safety. But is wasn't all bad. Above Reich talked about Seumalo's intelligence. Here the Packers try to play a little game with Seumalo. The down lineman tries to bait Seumalo into blocking him so the linebacker has a free run at Wentz on a delayed blitz, but Seumalo recognizes what the Packers are doing and stays home to pick up the blitz. He also showed good coordination and balance when blocking in space in the screen game. This play was called back on a DGB offensive pass interference call, but Seumalo did a good job springing a big gain with a block on the elusive Clay Matthews, had it counted. As noted, Seumalo was much better against the Redskins. There were no egregious moments like the ones noted above. He was very good in pass protection, both anchoring against bull rushes, as well as mirroring and matching rushers who tried to go around him. There were almost all positives. To begin, Seumalo was far more aggressive on Sunday. Look at what he does here to Redskins DE Chris Baker (#92). And then again he gets Baker to the ground on a big Ryan Mathews gain. Here Seumalo seals off Baker, and then hustles to push the pile. On this one, you have to look closely, but here's a play where Seumalo blocks a linebacker, who goes to the ground, and then after the ball comes out, Seumalo decides to give him another shot. Seumalo also showed good quickness pulling from his guard spot. Here he comes across and gets a good pop on a linebacker. And again. The linebacker throws Seumalo to the ground after the pop, but the effective block has already been made. With the Eagles being 5,000,000-to-1 shots to make the playoffs, they may as well play their rookies. In the case of Seumalo, he may have shown against the Redskins that he is already better than current starting LG Stefen Wisniewski. There's really no reason for Seumalo not to start again this week against the Baltimore Ravens.